I am so excited to be dedicating a day each week to talk about all things pregnancy! If you are pregnant, hope to be pregnant or have been pregnant, please share your tips, tricks and questions! My goal is to enjoy these 9 months to their fullest and learn a few things along the way! Ok the first one is something practical yet amazing. The thing is, I hate body pillows. I said it. They are too big and clunky and hot and they get in the way and let’s just leave it at hatred ok? I think we can all see that. So, when I was pregnant with Oscar, my friend Regan loaned me her Boppy Pregnancy Wedge to help support my big giant belly while I slept on my SIDE. Did I mention that I also hate side sleeping? I am a total back sleeper, but thanks to the wonders of pregnancy, my nasal passages get so swollen when I sleep on my back that I stop breathing and then gasp and sputter for air. At which point Jerry wakes up because I have suffocated him with morning breath and asks tells me to roll over. So the pillow. It’s magic and you need one. You probably won’t need it until your 2nd trimester but I just turned that corner and used it last night. Amazing. Also? I never returned Regan’s pillow because I became addicted to it. Don’t worry, I just bought her a new one. I know I know. BOO! BORING. What kind of list is this? But it’s true. Pregnancy can send me straight to the pit of despair if I am not careful. Something about hormones and not sleeping well and feeling all gross. But I am telling you, a couple workouts a week does WONDERS for my mood, not to mention helping me avoid gaining 50lbs like I did with Oscar while I was NOT exercising but sitting in a cubicle all day. Healthy Moms offers prenatal low-impact aerobics classes all over the place. So find one, and go! Another simple yet so true suggestion. Nay, command! You GOTTA drink your water ladies! It helps that I love water anyway, but I have to say that being pregnant really makes me crave it. Like all the time. Remember that your wee lil babe is swimming around in amniotic fluid that has to replenish itself to stay clean. So that means you have to provide the refill! Have you had your water today? I am really fortunate in this area. I mean seriously, we are ALL drinking the water in my town. But I have found that having pregnant friends can really take the edge off on those hard days. Think of them as your glass of wine. No one else understands like they do. And even better, no headaches! Besides, how else would you learn about all the latest new baby gear? If you don’t know any pregnant gals in person, I have found awesome community on message boards via BabyCenter and Babyzone. And believe me, when you have questions and complaints, no one listens better than the internet! I am serious. You NEED cheeseburgers. Or bagels. Or Salami. Or Oreos. Or an Oreo Salami Bagel Burger. My point is, find your treat and stock up. A pregnant lady is working hard all the time. You get to have treats. Just don’t go crazy, remember tip #2 and enjoy. You’ll be JUST fine. How about you? 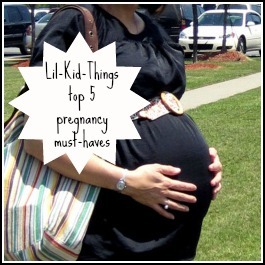 What are YOUR top five pregnancy must haves? Did I miss something crucial? Tell me! Or if you want to continue the fun and write your own blog post about it, link it up here and we can all learn together! Disclosure: I was not compensated in any way for mentioning the above people or products. I just love em that’s all! 3. my chair…it’s a chair in my living room where I lounge…so comfy! 5. FRUIT….oranges, apples…whatever I can get my hands on 🙂 You would think because of this one I wouldn’t need #4…but not so much. Water and exercise…totally! I agree 100%. I would add the Bella Band. Maternity pants never quite fit me right. I wore the Bella Band with my old pants my entire pregnancy. Congrats on getting the win to go to the NC Mom Blog Conference. I was in on the Twitter party. I SO wish I could go! Not pregnant here not going to be pregnant again (not possible any more), but I have to agree with drinking water. It is so important for your health and will make you feel much better. This post brings back such good memories! I loved being pregnant, even through the tough times. Enjoy this time! I love the pregnant friends are a like a wine for a pregnant woman line. Too funny. Too True. You named some of the best! 1. Pillows- I think I have 5 right now. 2. Exercise- I’ve been walking alot, and I love my prenatal dvd MommyShape. It has a little bit of everything and I don’t get tired of it! There is even a great dance portion that gets you to swing those hips. I’ve felt pretty good this pregnancy, no low back pain, no ankle swelling or varicose veins- and I think it’s from exercising consistently. 3. Floradix- a fantastic iron/B vitamin supplement recommended by my midwife. I was borderline anemic at the beginning, plus I don’t eat much meat. This stuff has made a drastic difference in my energy level! And unlike other iron supplements, it does not tend to be constipating. Of course, I also support the consumption of nutritious, iron-rich foods too. 6. Gotta add one more- activities for my 3 year old so I can get some rest now and then! I LIVED WITH MY BOPPY! great picks! Thanks for the link lady! But Colace as mentioned in your first post is a MUST MUST. Blech. This post makes me smile. Mostly because I know I’ll never be pregnant again, LOL! Let me expound a bit on the working out thing. I started taking yoga a month of two before finding out I was pregnant with our 4th child in 4 years (who is now 4 months old). At first I was concerned I’d have to stop but the lovely instructors at my local YMCA were very supportive and I was able to keep doing yoga (not prenatal, but regular yoga) until the week before I gave birth. It made a HUGE difference in my delivery and recovery. With our 3rd child, I was ready to kill someone at 6cm, but with our newest addition, I walked into the hospital at 5cm feeling no pain at all. Even though my kid had a humongous head and was over 9 pounds at birth, I hardly tore, and after a month I was within 5 pounds of my pre-pregnancy weight and fitting in my normal clothes again. I credit it all to yoga, because I know I was eating entire frozen pizzas and drinking soda all during the pregnancy! You left out fries! lol – I love them. They were my favorite food when I was preggy! I ate PB&J throughout one of my pregnancies the whole time. It was a crazy addiction. I also LOVED my body pillow. Great list. MMMM… Salami Bagel Burger! It’s been so long since I’ve been pregnant, I cannot remember!! The only thing I really loved was my body pillow! That belly is hard to sleep with!